Cover art by Matthew Rivera. Cover design by Tony Peralta, The Peralta Project. 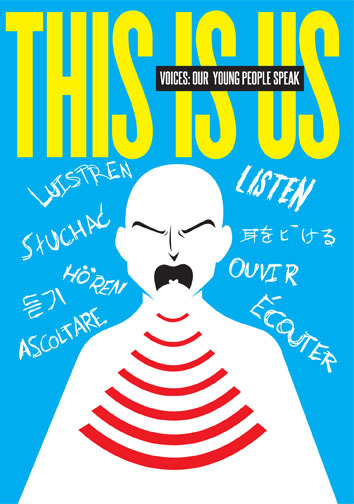 Our teen program, Voices: Our Young People Speak, came to a close at the end of April with a bang. A collaboration between Word Up Community Bookshop and People’s Theatre Project, this 16-session program culminated in a book and performance based on writing and ideas that the group developed throughout the spring. The nine teens from Northern Manhattan—Enmanuel Bencosme, Noa Caines, Sonali Chigurupati, Anakeiry Cruz, Fridda Fernandez, Nickolas Khimerik, Arianna Lora, Matthew Rivera, and Ashley Tavarez—devised a play, This Is Us, which they performed for over 100 people at two performances: their debut performance at the United Palace of Cultural Arts, and the next-day matinée at the Morris-Jumel Mansion. The book, produced by Word Up and also titled This Is Us, will be available at the bookshop when we reopen! Book signing after the opening night performance. Photo: United Palace of Cultural Arts.